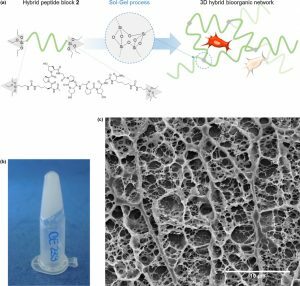 Conceiving biomaterials able to mimic the specific environments of extracellular matrixes are a prerequisite for tissue engineering applications. Numerous types of polymers (PEG, PLA, etc.) have been used for the design of biocompatible scaffolds, but they are still less efficient than natural biopolymers such as collagen exts. Chem. modified and loaded with different bioactive factors, biopolymers afford an environment favorable to cell proliferation and differentiation. Unfortunately, they present several drawbacks, such as weak batch-to-batch reproducibility, potential immunogenicity and high cost of prodn. Herein we propose a fully synthetic covalent hydrogel obtained by sol-gel polymn. of a silylated peptide. We selected a short and low mol. building-block derived from the consensus collagen sequence [Pro-Hyp-Gly]. Interestingly, the sol-gel process occurs in physiol. buffer, enabling the embedment of stem cells. 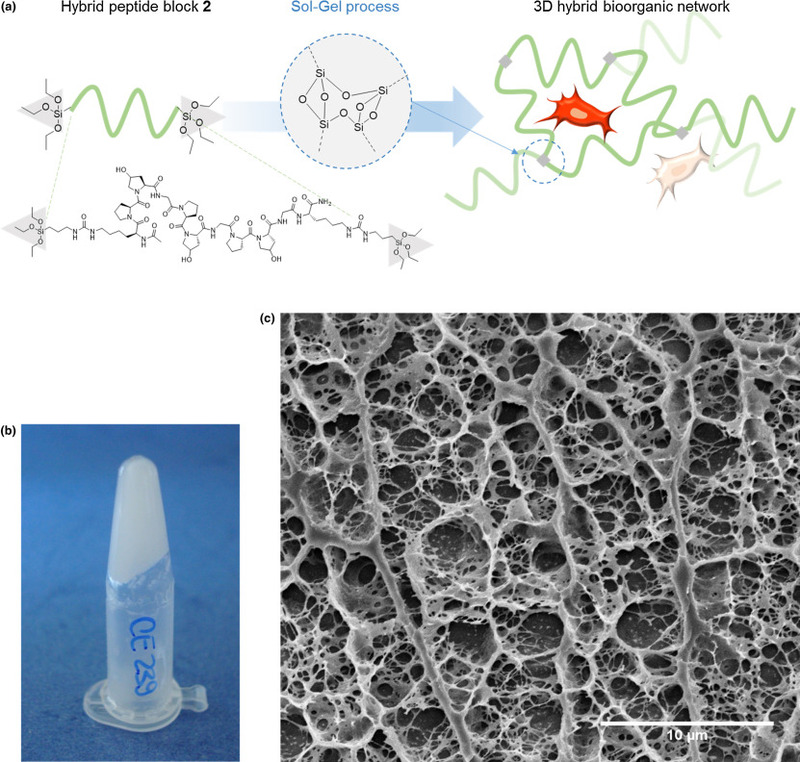 This collagen-inspired hydrogel provides a cell-friendly environment comparable to natural collagen substrates, demonstrating its potency as a biomimetic scaffold.